The 10 Best Smoothie Places in Pennsylvania! Having trouble fitting the daily recommended amount of fruit and veggies into your busy lifestyle? We get it. Sometimes, it's difficult to find the time to make healthy eating a priority. When you want something convenient that's packed with nutrients, vitamins, and minerals—why not reach for a smoothie? Make getting your five-a-day easier (and tastier) with a smoothie from one of the 10 best smoothie places in Pennsylvania. P.S. & Co. isn't just the place to go for smoothies. Along with smoothie flavors like sweet potato spice and tiramisu (and yes, there's actually tiramisu in it! ), P.S. & Co. offers up fresh pressed juices, acai bowls, and has an entire menu of delectable organic, vegan, and gluten free dishes. We're drooling just thinking about it. At Greenmouth, smoothies are the start of the show. They feature organic ingredients and tasty combinations of superfoods in flavors like Cacao Coconut Almond Joy, strawberry cheesecake, and caramel maca frappe, to name a few. Honestly, what more could you ask for? 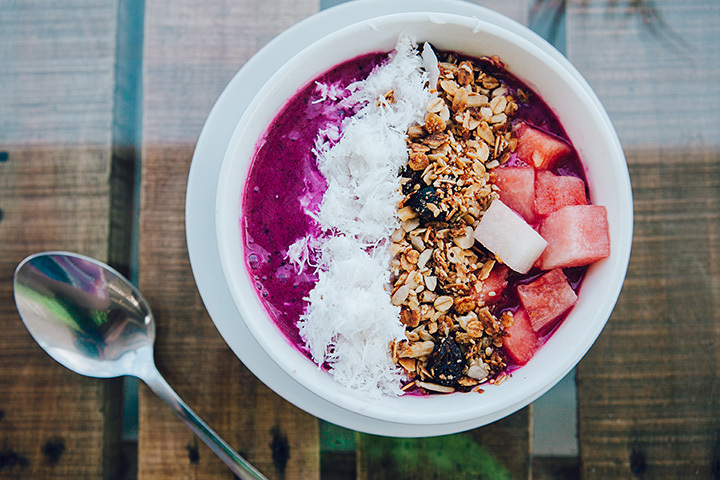 In you're near the Main Line, Raw Can Roll Café is the place to go for smoothies, acai bowls, and raw vegan cuisine. Their website states that they want their guests to "feel, look, and become better and healthier." Have you ever heard of a restaurant with customer-focused vision like that? We haven't. Gangster Vegan Organics is committed to making it "Ganster" to eat healthy. Featuring everything from raw, organic, vegan smoothies, juices, and wellness shots to salads, burrito bowls, and burgers—there's something for everyone...meat eaters and vegans alike. And, if you buy any of their branded merchandise, an inner-city child gets a free vegan meal. You can do good—while eating good! The name says it all. At Sip-N-Glo Juicery, the emphasis is placed on ingredients that will make your body, mind, and soul just...glo! Each smoothie and juice is created with a specific goal in mind—from enhancing performance to boosting energy (and more). If you ask us, Sip-N-Glo is a must-go. According to the website, Greenstraw Smoothies serves up the best smoothies, bowls, and juices in Bucks County. Try the Blackberry Forest, Mocha Morning, or one of their many other smoothies today and see for yourself. At Salúd Juicery, the mission is to reconnect patrons with God's good earth. Along with smoothies, this juicery offers fresh juices (of course), shots, acai bowls, and hot drinks. Stop by to try something and reconnect today. With its Instagram-worthy decor, satisfying smoothies, and winning wraps, Bimini Juice Bar brightens up the Northern Liberties section of Philadelphia. Try one of their 13 smoothies or 14 juices today or create your own. We doubt you'll be anything but delighted. Whether you're looking to get your early-morning juice fix in or craving a post-workout taco, Jaco Juice & Taco Bar has you covered. And if you're feeling a little extra, you can add hemp, chia, flax, spirulina, PB Fit, or bee pollen to any smoothie or drink. The Mellow Minded Café is a cross-between someone's cozy home and a quaint café. They've got a smoothie for each palate—from fans of everything green to sweet satisfiers like the Luscious Chocolate Almond. And if you're feeling inflamed or having tummy troubles, they've got smoothies to settle that, too!